Balsamic Chicken is an easy, flavor-packed recipe you’ll love. 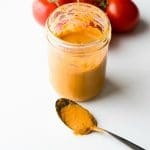 Sweet, creamy, a little bit spicy mushroom sauce, all made in one pan makes this recipe a winner! Moist, succulent boneless chicken breasts, caramelized onions and mushrooms in a creamy, slightly spicy, balsamic sauce. Sound good? I love a flavor-rich one skillet meal especially when the end result tastes like I slaved over the recipe; but I didn’t! It’s great to have some sophisticated tasting meals, like this easy Balsamic Chicken, that can be whipped up without much effort that make dinner feel special. 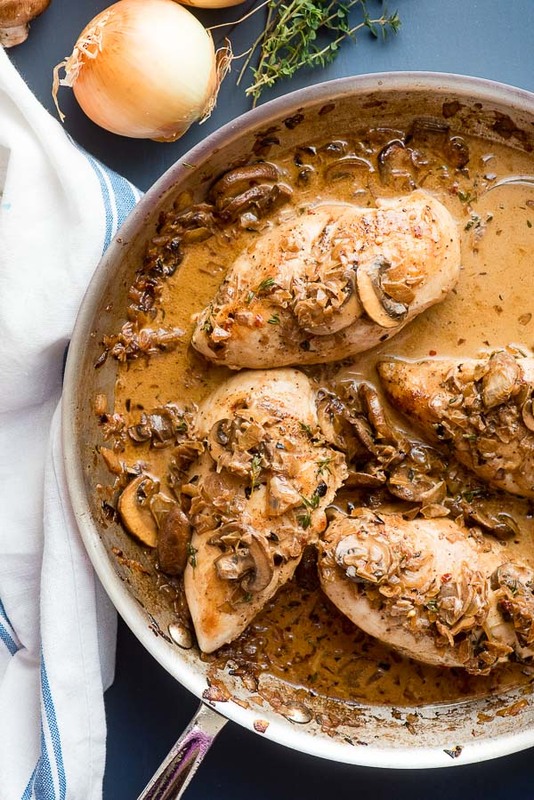 Balsamic Chicken with Creamy Mushroom Sauce has perfectly cooked boneless chicken breasts topped with caramelized onions and cremini mushrooms in a balsamic cream sauce. 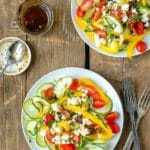 The ‘balsamic’ is from the addition of balsamic vinegar which is aged to a sweet, lightly tangy flavor that is irresistible. 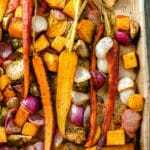 Add a side of potatoes or rice, some vegetables or salad and you are good to go! This balsamic chicken is an easy recipe packed with sophisticated flavor that you’ll love. It’s ready in under an hour and all cooked in one skillet. I love using Cremini mushrooms which are also known as baby Portobello mushrooms. Portobello are the larger meaty tasting mushrooms often substituted for meat in veggie burgers. Cremini mushrooms are similar in size to white mushrooms but naturally have great flavor (white mushrooms have very mild flavor). 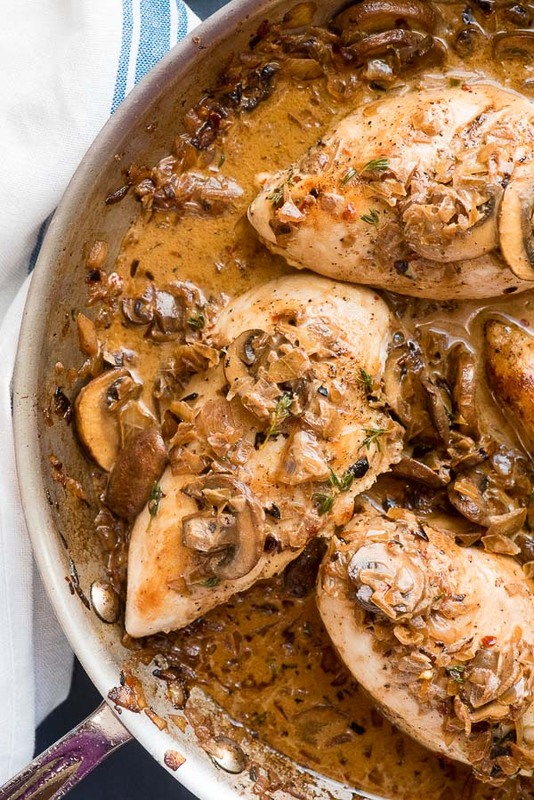 After cooking the chicken, onions and cremini mushrooms are caramelized in the same skillet giving them an even deeper, rich flavor. I have a little secret when cooking boneless chicken breasts that ensures they stay moist every time. They are seared briefly and then left to cook off the heat, in a covered skillet. This allows them to cook slowly retaining their moisture every time. 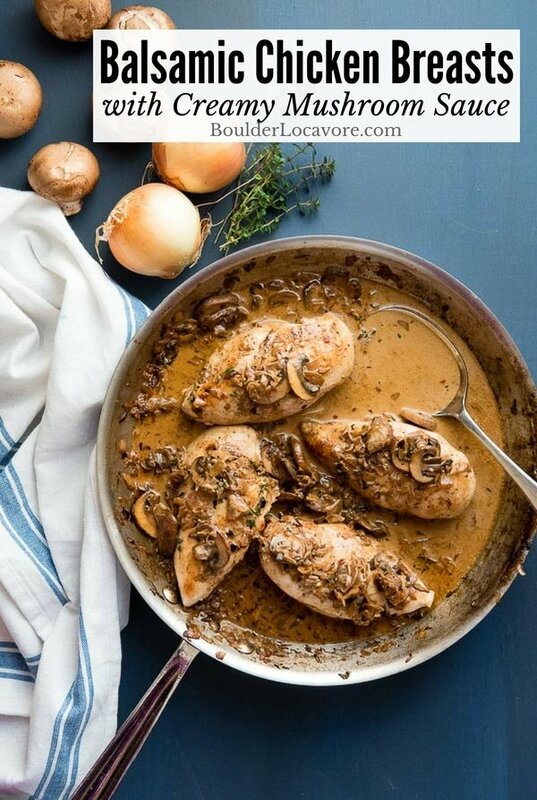 In this balsamic chicken recipe they rest off the heat while the delicious sauce is made, then are added back into the sauce before serving. A version of this chicken breast cooking technique is used to make moist homemade shredded chicken breast which is one of the most popular recipes on Boulder Locavore. Not only is the method successful in keeping the chicken from drying out but it makes easy, delicious shredded chicken with a fun trick. Melt the half of the butter in a large skillet and brown the chicken for 4 minutes per side. (photo 2). Turn off the heat, add a lid to the skillet and allow to sit for 10 minutes (photo 3). Place the chicken on a plate to rest and return the skillet to the stove top. Melt the remaining butter over medium-high heat (photo 4). 5. Add the onions and sauté picking up the browned bits from the pan (photo 5). 6. Add the mushrooms (photo 6) and stir occasionally letting them cook for 15 minutes (photo 7). 7. Combine the chicken stock, vinegar, thyme and red pepper flakes in the skillet (photo 8); cook until the sauce slightly thickens (2-3 minutes) (photo 9). 8. Reduce the heat to low. Stir in the cream (photo 10) and return the chicken to the pan to cook in the sauce for a few minutes before serving (photo 11). Balsamic Chicken is an easy, flavor-packed recipe. Much of the cooking time is actually passive time where you don’t have to do a thing. I think this saucy chicken will become a new favorite! Mushrooms are grown in a soil substrate so often will have some remaining when purchasing them. Use a mushroom brush (a soft bristled brush to wipe away any soil residue). The brush bristles are dampened and then easily brush off any soil without changing the mushroom. Wipe them gently with a damp paper towel. It removes the dirt but doesn’t change the mushroom. 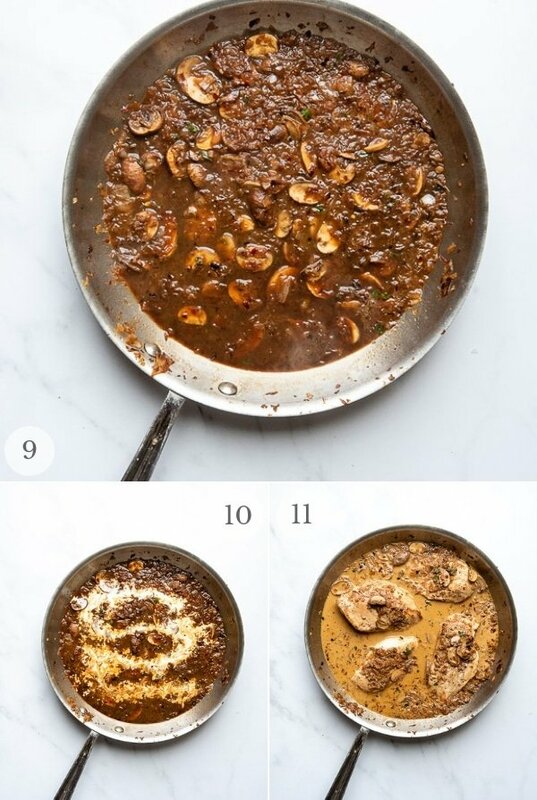 If you’ve tried this Balsamic Chicken with creamy Mushroom Sauce recipe please RATE THE RECIPE below! 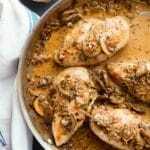 This easy chicken recipe is rich in flavor making it perfect for any dinner or entertaining guests. The chicken timing is geared to larger chicken breasts to ensure they will cook without drying out. If using smaller chicken breasts reduce both the on heat cooking time and the resting time. Salt and pepper the chicken breasts. Melt 2 tablespoons of the butter in a large heavy skillet (with lid) over medium-high heat. Place the chicken breasts in the pan and cooke 4 minutes; flip and cook an additional 4 minutes. Turn off the heat and place the lid on the skillet allowing chicken to continue to cook off heat for 10 minutes. Remove chicken from the skillet and place on a plate (note: it will continue to cook as it rests). Melt the remaining 2 tablespoons of butter in the same skillet over medium heat. Add the onions and saute to combine with the butter and pick up loose bits from the chicken; 1-2 minutes. 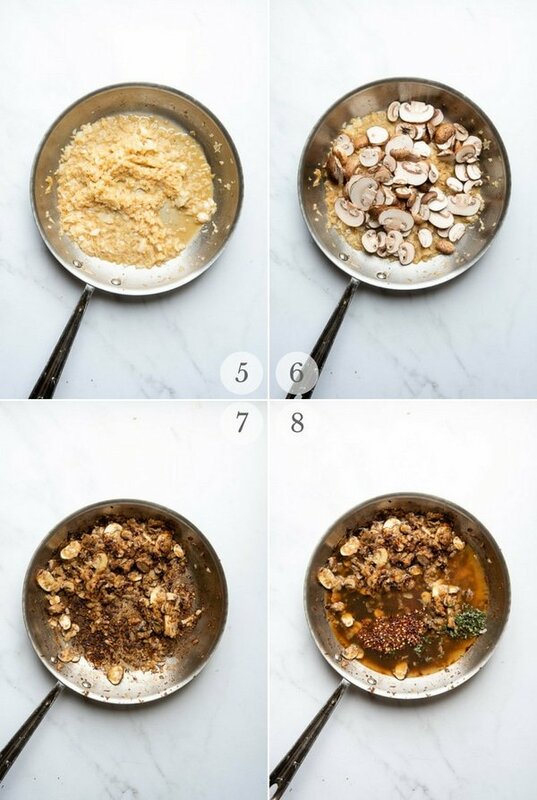 Add the mushrooms and stir to combine. Continue cooking, stirring periodically for 15 minutes. Add the chicken stock, vinegar, thyme and red pepper flakes. Increase the heat to medium-high, stirring often and allow to simmer to slightly thicken; 2-3 minutes. Lower the heat to low, stir in the cream. Add the chicken back to the skillet and spoon the sauce over the chicken and allow to warm in the sauce for a few minutes. Serve hot. * to clean the mushrooms use a mushroom brush or damp paper towel to gently wipe any soil from the mushrooms. Looks so perfect! Definitely a must try this chicken recipe! This looks like an amazing dinner! What a fabulous meal!!! Wow this looks so delicious! I love how the sauce is so creamy! WOW!! Such an incredible dish!! I absolutely LOVE the mushroom sauce! Can’t wait to try this recipe! Chicken and mushrooms are so perfect together! I love the idea of balsamic chicken! Five stars for sure! Made this tonight and it was delicious! Searing the chicken and then letting it rest worked like a charm. The meat was moist and perfectly cooked. I didn’t have any heavy cream on hand so I used sour cream. It worked well with the balsamic sauce but lacked the lusciousness that cream would have given it. Thank you for a simple, delicious recipe! I applaud your inspiration when not having cream on hand Jane! Isn’t that chicken cooking trick a dream?! Thank you for your time in leaving your comment. Such an amazing meal! I want to have this regularly! My family is going to love every bite of this! Love the sweet, sour, creamy combination all in one sauce. Perfect for the chicken! 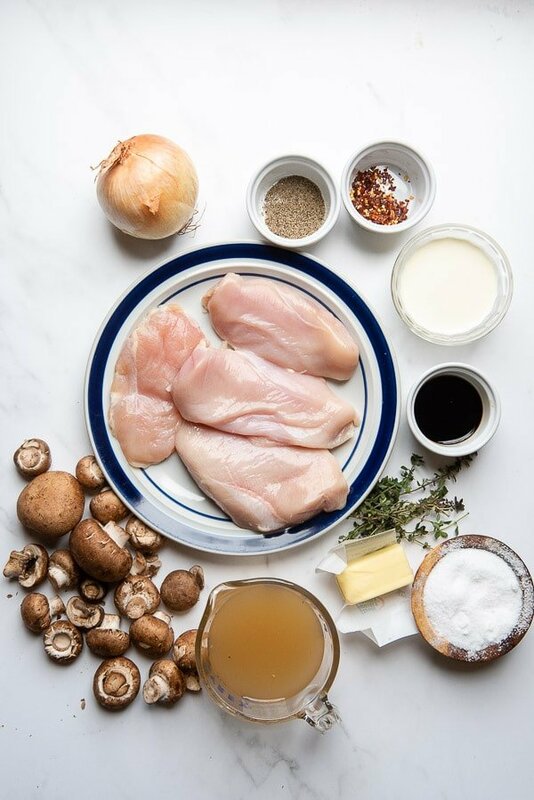 What a dreamy chicken recipe- all of my favorite things in one place! Balsamic is one of my favorite flavors! I have to add this to my menu! The sauce for this chicken is outstanding! A beautiful chicken dish! My husband hates vinegar of any kind, but I’m sure by the time the cooking is done the balsamic vinegar has cooked off. So I might have make this when he’s not in the kitchen! This was such a delicious, easy dish and my family loved this! I served with some penne, and next time, I’ll include some crusty bread to soak up the delicious sauce! This is definitely a keeper! So glad you loved it! Thank you for sharing your experience! I can’t wait to try making this for dinner! I love everything about this dish! It is such a great idea to sear the chicken so it holds in the flavour and the juiciness. I am going to have to give this recipe a try. Do Nancy! 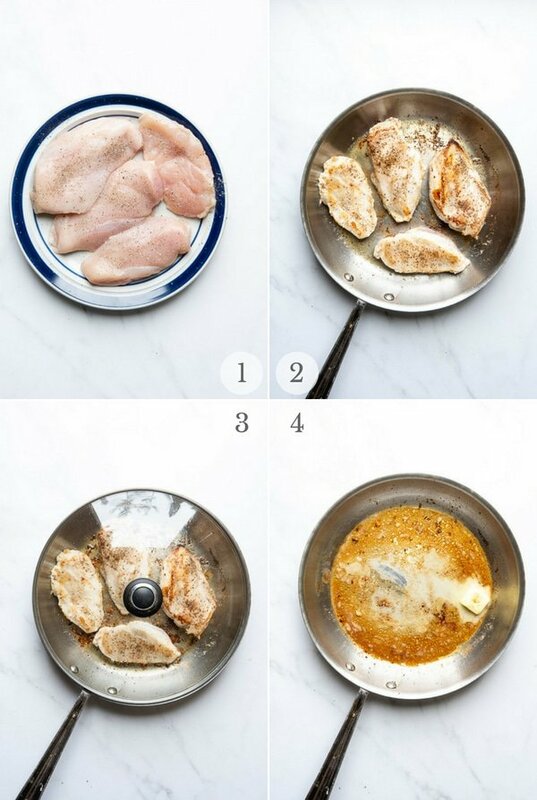 This cooking method for chicken breasts is my favorite. They are always so juicy and flavorful. AND when they are then added back to the delicious sauce they aren’t over cooked and taste stewed! I love balsamic chicken. I would probably do a variation of this and put it in a salad. This is a nice way to make chicken breasts. Chicken is a family fave here, so I’m always happy to find a new recipe.